In other low-code platforms developers are constrained by numerous limitations. In the worst case scenario, developers need to modify the platform-generated source code to meet their business needs. This is a tortuous situation because once modified, the source code cannot be put back into the low-code platform for on-going maintenance and extension. So thousands of lines of (often rather ugly) source code have now been dumped onto your team. This is a fast way to encumber your already overtaxed developers with even more technical debt. In even the best of the other low-code development platforms, when developers try to reach beyond the capabilities of the platform (for example to implement complex business logic) the only remedy they have is to drop down into another IDE and code extensions in additional scripts and languages that are integrated with the other generated code. This is troublesome for a number of reasons. The additional code needs to interface through specific low-code platform extensions and/or APIs which confine and add to the complexity of the development. The additional code artifacts need to be externally version controlled and configuration-managed to coincide with the versions of the generated low-code application(s) for which the added code was written. You would be introducing technology-standard version interdependencies between the additional code, the generated low-code applications and the low-code platform itself. These all sound like typical software engineering problems that can be managed and solved by developers as they often are thought of as the normal course of software development practice. They are indeed. But they are not without significant cost and consequence. And you end up with more technical debt, challenging software deployments and managed complexity. Maybe low-code platforms will get better to help solve these issues? One of them has. What Makes LANSA So Special? Our roots are in Rapid Application Development, so we have a long history of shielding developers from underlying technologies - not generating heaps of code for them to maintain. Our “generated code” is never seen by developers because all development, testing, and debugging is done within the IDE. The platform handles scaling, integration, security, device specific features, and much more. As technology evolves, LANSA simply updates the platform to enable your existing applications to incorporate the new capabilities with little or no disruption. So you don’t have to ever see the generated code. But what about application development situations that require some amount of additional coding to reach beyond the limitations of low-code drag-and-drop designing? With LANSA, developers who need to reach application complexity beyond the limits of low-code can use the one powerful LANSA programming language for the client-side, server-side, and everything in between. 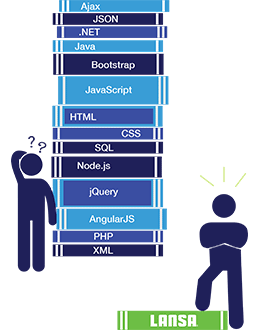 When compared to traditional development methods, LANSA replaces 5-10 different programming skillsets. Using the single LANSA skillset not only simplifies the training of new IT talent, but streamlines resource management for assigning tasks and accommodating for IT days off, sick time, vacation and more. And with the knowledge of any other programming language, a developer can very quickly learn Visual LANSA. When LANSA developers maintain applications they only use LANSA's low-code WYSIWYG designer and powerful high-level programming language to change and extend any mobile, web, server or desktop applications running in the cloud or on-premises on a variety of different database and server combinations. With LANSA, you build once and deploy anywhere. Best of all, LANSA’s language is completely open and compatible with other technologies. Besides being able to publish and consume RESTful services, LANSA also allows you to directly leverage any of your existing DLLs, .NET components, ActiveX controls, JAR files, etc. So integration between your new Visual LANSA applications and your existing application and data infrastructure is easy. LANSA is the best of low-code because you have all of the speed of producing high-quality, high-scale applications for any device or form-factor with the ease of visual drag-and-drop design. When you combine that with the power of one programming language, you get low-code without limitations. With LANSA we can create green-screen, Windows, XML and browser applications from a single set of source code. Everything we write is 100-percent LANSA, so now we are not locked into a specific platform or database. With LANSA my staff are agile enough to work on just about any business project required. I don't have to wait for the RPG expert, WebSphere expert or the C++ expert. Instead we spend time on getting the business solution in place. Peter Burns, director of information services at High Liner Foods, Inc.